The dietary requirements of pocket pets are quite a bit different from those of the carnivorous cat or omnivorous dog. In the wild pocket pets constantly graze throughout the day on a variety of grasses, plants and greens. In the home, here’s how to keep your pets healthy and well nourished. Hay is an essential part of the rabbit and guinea pig diet and makes up a large portion of what they eat in the wild. It should be available in unlimited quantities to your pets, to rabbits in particular. Hay is high in fiber and helps keep teeth in check, especially important to rabbits and their constantly growing choppers. Because of this, it’s important to give your pets high quality hay that is nutritious and beneficial to them. Hay should be greenish in tint and fresh smelling, never dry, yellow and dusty. Timothy hay is the most nutritionally favorable to guinea pigs. Alfalfa hay is more common but should only be given on a daily basis to babies and pregnant guinea pigs as the calcium content is too high for daily feedings to normal guinea pigs. Beware of hay that makes your pets sneeze as this is a sign of dust or, even worse, mold. Commercial pet foods are the easy and convenient way to supply your pocket pet with a balanced daily diet. Hamsters eat a mixed grain feed or pellets, gerbils, rabbits, guinea pigs and rats have food that comes in pellets or blocks. Block foods have the added benefit of helping to keep teeth in shape and satisfy some of the ‘gnaw reflex’ that pocket pets have in abundance. Commercial foods can also be left in a food bowl for longer than fresh vegetables, which have a tendency to wilt. Small animals are, for the most part, vegetarian in their dietary needs. This means that giving your pocket pet a good selection of fresh veggies and some fruits to supplement their diet of pellets will give them all the nutrients they need. Carrots, broccoli, peas, and other vegetables you’d see on your table at home are an excellent place to start, but make sure you feed them to your pets raw and not cooked for maximum benefit. Don’t be afraid to leave the greens on carrots and other vegetables, green food is essential to their diet as many pocket pets eat a lot of grasses in the wild. Protein is also important and hamsters, mice and rats are omnivorous, so they will also happily munch on small insects like mealworms, crickets and grasshoppers as well as things like cooked ground beef, cottage cheese, yogurt, etc. 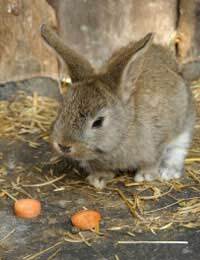 Rabbits, gerbils and guinea pigs, however, are strictly vegetarian. This is an essential for guinea pig health as they can’t produce vitamin C within their bodies and (like humans) can get scurvy from lack of it. Adult guinea pigs need between 30-50 mgs of vitamin C a day. You can buy vitamin drops and put this in their water bottles, but as vitamin C deteriorates in water fairly quickly, it’s better to portion out and crush up a chewable vitamin C tablet and put it in with food. If a good supply of fresh veggies and fruits is being fed on a regular basis, guinea pigs will also be receiving vitamin C from their diet. All pocket pets have teeth that are constantly growing throughout their lives, which is why they are always in search of something to chew. Providing hard objects like sticks, dog biscuits, blocks of untreated wood, chew treats and bones will help wear down the teeth and prevent dental problems.